Originally posted in 2011, I wanted to update and re-post this as California (and the country) deals with the wettest winter in years, ending years of drought. Our thoughts are with all who are in the areas of the state-wide wild fires that devastated the homes and communities of so many. These areas are extremely vulnerable to flash floods and mud slides. Hopefully, this post might help some of you deal with the damage that the flooding may have caused to your gardens. 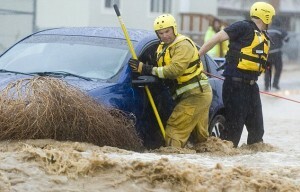 As we in LA County and Orange County wait for the largest storm to hit, our thoughts and prayers are with the residents in our most vulnerable areas: Station Fire areas, parts of our coastline and the residents of the Laguna Beach neighborhoods, San Diego areas , parts of Arizona and Nevada which experienced flooding within the last few days. HGEL would like to post some information to support its fans who may be concerned with what effect all this rain and, especially for our hardest hit residents, all this flooding will have on our garden soils, plants and edibles. Depending on your soil texture (sandy, silt, clay, loam) and structure, your soil will deal with this intense rain and flooding differently. Sand, having the largest air pores, drains the fastest; clay, the slowest. When there is runoff or slides, the soil in your garden becomes mixed with soils as they run off from higher elevations possibly changing your soil composition and structure. In flooding situations, soil can possibly be contaminated depending on where the flood water came from and if sewer lines or septic systems were compromised. When it comes to vegetables, it’s important to know whether your soil is contaminated or damaged by mudslides or flood water. If you’re unsure, BE SAFE! Once the soil is dry, submit a soil sample to a local soil lab for a full test before you do anything else. Be sure you tell the lab what your concerns are so that the appropriate test(s) can be run. Because you’ll be replanting gardens that have been covered with considerable run off or floodwater it is best that you request a soil test for nutrient content of the soil (which may have been changed by the flood waters), as well as for possible pathogens. Although pathogens will eventually die out, they can remain present in the soil for several months. If the area was contaminated, it is recommended that no produce be used from the garden for 90 days. If you need a local soil lab, please contact your local county extension office (resources are available at HGEL’s website – https://www.groedibles.com/resources/fallwinter-gardening/. Even gardeners that escape actual flooding can suffer problems from prolonged rain, especially fruit and vegetable growers. Potato blight can be a common problem and it is suggested that you dig up your potatoes up and store them in a cool, dry place if this is a concern. As flood waters subside, poorly-drained soils can lead to waterlogging. Few garden plants are able to cope with long periods in ground saturated with water. When soil is waterlogged, plants literally drown. Water fills all the air spaces between the soil particles and this prevents oxygen from reaching the roots. In turn, this causes the soil environment to be anaerobic and prevents root growth and can eventually kill roots. AGAIN, how concerned you have to be about using garden produce after a flood depends, to a large degree, on whether that flood water was “clean” or contaminated with sewage or industrial pollutants. Raw sewage contains bacteria that can cause illness if contaminated fruit or vegetables are eaten. The most conservative answer — one that eliminates any and all risks — is that you discard all produce that was covered by contaminated flood water. Another choice would be to use root crops such as carrots, potatoes, and parsnips, but scrub them thoroughly, and cook them. Boiling kills any harmful bacteria or other microbes present. Leafy vegetables such as lettuce, cabbage, or spinach should be discarded because it’s not possible to scrub them, and they have many ridges and crevices that could contain contaminated silt or bacteria. Vegetables that result from flowers produced on growth that develops after flood waters subside should be OK. To increase safety, cook them thoroughly, too, or at least wash them well and peel them, if possible, before eating. This could include tomatoes, peppers, eggplants, sweet corn, squash, cukes, and similar vegetables. Examine produce carefully before picking it. If it is soft or cracked, or has open fissures where contamination might have entered, throw it out. Produce from plants that survive flooding with water that was not contaminated should also be discarded if they are bruised, cracked, or otherwise blemished. Root crops from “clean” flooding should be OK if the upper parts of the plants survive essentially undamaged. Do not use produce from plants that yellow and wilt, regardless of the type of flooding… It’s not worth the possible risk.